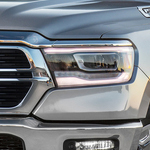 If you are considering the Ram 1500 as your next light-duty pickup truck, our team at Ram Country Chrysler Dodge Jeep thinks this is an exceptional model. It is a popular light-duty truck with consumers because it has much to offer, such as innovative capability features that you can read about below. The standard engine that's featured with the 1500 is the 3.6L Pentastar V6 engine with eTorque, which offers best-in-class standard V6 horsepower. With this engine, you get 305 horsepower and 269 lb.-ft. of torque, and it has a maximum towing capacity of 7,730 pounds. You can choose the available 5.7L HEMI V8 engine if you want additional power under the hood. This engine can reach 395 horsepower and 410 lb.-ft. of torque. If you choose to equip the 5.7L HEMI V8 engine with eTorque, you get best-in-class V8 towing of 12,750 pounds. This engine also offers best-in-class V8 combined fuel economy.